Camp Dish Cleaner: The Scrubr! Scrubbing dishes clean in the backcountry is a chore I’d rather ditch. My usual ad hoc solution — water and fingernails scrapping against food-coated metal — is not fun and also not super effective. New this year, Lunatec, a company in San Diego, introduced a simple cloth-like scrubber to aid in cleanup after dinner at a camp site. The Scrubr is dubbed “the ultimate camping dishcloth,” and it is made to be used as a scouring pad in place of the throw-away variety you buy at a grocery store. This spring, at home and while camping, I’ve tested the Scrubr to happy results. The thin cloth has a coarse, gritty face that easily cuts through food stuck on a cooking surface. The Scrubr costs just $3 on Lunatec’s store. It is made of woven nylon and polyester fibers that give the cloth its edge. The fibers do not absorb much water, even when submerged. Bonus: The Scrubr weighs essentially nothing, packs small, and dries quickly after use. 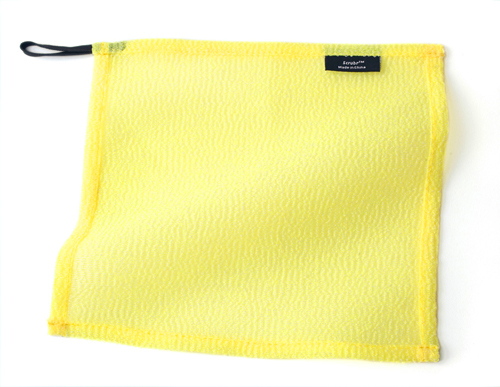 Collectively, at home and in camp, I’ve scrubbed dozens of dishes this summer with the Lunatec cloth. It has kept its coarse “edge” and remains usable for many dishes to come. My resolution is to replace gunky grocery store pan-scourers with this superior solution. My fingernails are thanking me already for the decision. next:What the F^$# is GORUCK?